GENERAL LOCATION Western Washington County, just north of Moore Lake. 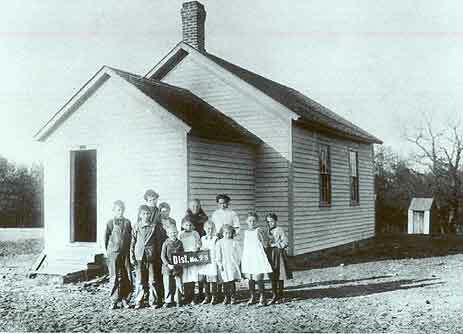 1870: School is first held in a building situated in a grove north of a Herbert Ames’ house. A new school is built later that year. 1920s: A new yellow stucco school replaces the old. 1937: The school is consolidated to St. Paul Park along Mooer’s Lake, named after a fur trader of MN. Most of the records of this school are incomplete. Before it was rebuilt, it was known to be a very small school, and apparently had shown its “wear and tear”; clearly it deteriorated greatly over the years. Roads were known to be either sandy in the summer or blocked by snow in the winter so attendance was very poor. In 1899, there were 27 pupils, half were of Native American descent. Poor attendance by students was a significant problem at this school, as noted by many of the teachers. Other teachers: (before 1898): Mary Daulton, Lydia Wilkins, B.R. Morrisy, Mary Collopy, George Hammer, Addie Mosher, Annie O’Connor, Laura Goff.